Update: It seemed to me that this article could be taken as bashing Tennessee and I just want to make it clear that Tennessee and Scotland are my two favorite places in the world. 1. My grandfather grew up in the mountains of Tennessee and as a boy would often disappear into them for the whole day with just his gun and his dog. 2. I live in Taiwan and every time the Chinese ask where I'm from, I say America, and they say where in America, and I always say Tennessee because that's where I identify with, where the largest part of my ancestors came from, even though most of my relatives are now scattered over Georgia and Florida. We were in Tennessee a lot during some of the vividest years of my childhood 8-9 and 13-14 and we stayed in many people's homes all over eastern Tennessee, Chattanooga, South Pittsburg, Jasper, Viola, Rockcliffe, etc. Driving over Monteagle always excited me, because I knew we were going to stay either with my great grandmother or my aunt and uncle or my great aunt and uncle. My great grandmother's house was thick with suggested memories floating around the hazy silent air of those huge cold rooms still furnished as they must have been a hundred years ago. I devoured the old magazines up in the attic bedrooms and looked longingly at the gorgeous hills outside. Thankfully the poem I wrote then is not at hand to torture you with, but it was something about imaginary boundaries that couldn't be seen and begging the wind to take me with it and set me free. Mind you, one of my mom's missions in life was to get us out walking in the mountains whenever she could but it wasn't always like you could step out the front door and take off on foot to wherever you wanted to go. 1. So Tennessee forever, but before my ancestors came to Tennessee they were Scotch Irish and Scotland is the only place that felt like it was throbbing through my bones as I walked it. 2. Scotland has a deeply engrained tradition of letting people walk wherever they want all over the land. Can you leave your front door and walk in a straight line over countless people's properties in Tennessee? Therefore any discussion of where to retire so as to easily get a healthy walk everyday and not wear a rut around your house if you didn't have a car would have to include Scotland. Someone asked me recently what I thought about retiring in Tennessee versus Scotland, because they knew I had been to Scotland back in 2001. When we stayed with my great-grandmother near Viola, Tennessee, in an old columned house on top of a gorgeous hill, the gorgeous Tennessee scenery stretching in every direction was untouchable ... we could only walk on our own property. Again, there was a mountain trail to walk on ... if you drove to it. Half the point of healthy country living is being able to walk through it. Tennessee does not make it easy to step outside your door and walk for hours. 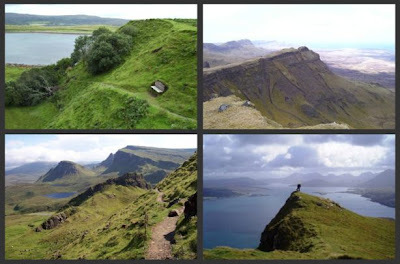 Now in Skye, Scotland you can step outside your door and run shrieking for miles all over the hills. And it's not 20-minute trails. There are 3-hour, 5-hour, 8-hour and 10-hour trails all over the island. 94 of them. Browse and weep: http://www.walkhighlands.co.uk/skye/ (Be sure to click on the area and then the individual walks to see the photos.) I wanted to die with happiness walking there. I cannot say I have ever felt in such extremities walking in Tennessee, though I have been full of happiness DRIVING through Tennessee. I just love Scotland, open to all who want to walk their hearts out. Look at the 41 walks right next door to Skye in Kintail and Lochalsh: http://www.walkhighlands.co.uk/kintail/ Look what they've got all over the highlands: http://www.walkhighlands.co.uk/ Or Google "walks" and "(name of place you were planning to move to)" and research it. Even Edinburgh with its castle and closes has a gigantic mountain park overlooking the city. And paths beside the weir winding through nooks and gardens all through the city. When I returned from Scotland I looked up every hiking and biking trail in Scotland, wove them into one big trail on a map, planned out each day ... and it would take me six months to do it all. I dream. But what if you want to live in both Tennessee and Scotland? How to afford the air fare switching back and forth every 6 months? See if you can make do with tiniest possible house and property in each place. I've always thought a great house had little to do with size and everything to do with smart design and ratio of windows to wall, how much it takes the outdoors in. The tiny homes on Google Image Search will make you drool, and then your head will explode. Now, a lot more goes into choosing a place to retire than the ability to go walking everyday from your doorstep. How available is the church? How available do you need to be for family and grandkids? On the other hand, living in two worlds is an eye-opening education for anybody, not to mention any kids still in the nest. You'll treasure your own country more dearly, coming back to it and seeing it from a contrast. Updated ending: Obviously I feel the best scenario would be to live in both Tennessee and Scotland if at all possible, but I would of course visit first and try out walks in both places before deciding where to move. Have you ever researched the trails in Tennessee? I believe the Appalachians have extensive trails. And when you were in Cherokee Granddaddy was just afraid of your getting hurt while visiting him. How would he ever explain THAT to his precious oldest daughter! I know the feeling.